Welcome to the Writing Center! 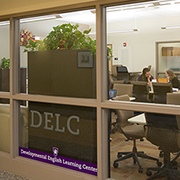 The Writing Center is a place where students can consult with tutors about writing for any class or project. Our focus is to support students in improving their writing skills. 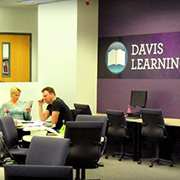 We promote student academic success and life skills development by providing free drop-in and appointment tutoring, during day, evening, and weekend hours, for writing in courses that range across the curriculum. Drop-in sessions are available all day. Students can also make appointments up to 2 weeks in advance by coming to the Writing Center front desk, checking the open time slots on the computer screen, and having the office assistant enter their names for appointments. Plan your time, coming in early in the writing process and leaving yourself time to revise. You may also want one or more follow-up sessions, and planning well allows you time to revise well and edit well. Bring a description of the assignment, if available, and be familiar with your professor’s expectations. Unless you are seeking a brainstorming session, bring a printed copy of your paper's most recent draft. Also, our printers are available to print works to be tutored. Let the tutor know what you are most concerned about, and be sure to ask questions. This relationship is meant to support your ability to write with confidence and skill. If you make an appointment, be certain to arrive 5-10 minutes early in order to get the nearest available tutor to your time slot. Arriving even one minute late means losing the appointment slot, but you can still get in line for a drop-in session. By reviewing this tutor schedule, you can determine the best times to drop in for a session. Hint: It's best to come when the most tutors are on staff to take sessions. Mon. - Thurs. 8:00 a.m. - 6:00 p.m.
Tues. Apr. 23 8:00 a.m. - 3:00 p.m.
Wed. Apr. 24 8:00 a.m. - 3:00 p.m.
Thurs. Apr. 25 8:00 a.m. - 1:00 p.m.
We will then be closed between semesters and will re-open for Summer semester on Monday, May 13. We promote student academic success and life skills development by providing free drop-in and appointment tutoring during day, evening, and weekend hours, for students Developmental English classes. Tutoring is available for English 0900, 0955, 1010, and 2010. Tutors can also help with writing projects from any WSU course. We provide peer tutoring for a range of developmental and lower-division courses, with a focus on general education courses. You can choose to drop in or schedule an appointment. Tutoring is free to all WSU students.